The idea for “Genesis” popped into the head of a Nimitz High School teen artist as the sun shone on her brother’s face. That defining moment led to dreams of a trip and future career in New York City for Evieh’bi Jan Nia Braddy from Aldine Independent School District. Earlier this semester, the Aldine ISD junior was notified by Harris County Department of Education Scholastic Art & Writing Awards coordinator Andrea Segraves that she had won a regional Gold Key for her reduction print, along with $1,000 scholarship check for the HCDE Trustees’ Incentive Award. On March 13, the young artist heard about her Gold Medal for her artwork from the nonprofit Alliance for Young Artists & Writers. As part of the award, she may travel to New York City to get her award at Carnegie Hall. “I want to know what New York is like,” said Braddy, eyes wide with the possibility. She has applied to attend the Pratt Institute pre-college program in New York City and would like to visit other visual art colleges in the Big Apple. Like many artists who struggle with their piece to get it just right, Genesis became an old friend to the 17 year old. 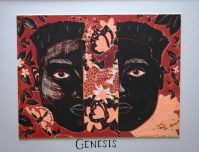 Genesis is a reduction print, which includes several hues of red and black with a pearlescent finish. In printmaking, artists must carve away or reduce portions of the printing block of linoleum, imprinting one color at a time at intervals through a baby press. Subject matter is sketched and colors are planned well in advance. Initially Genesis was smaller and got a perfect score at a visual scholarship competition but didn’t advance to state. 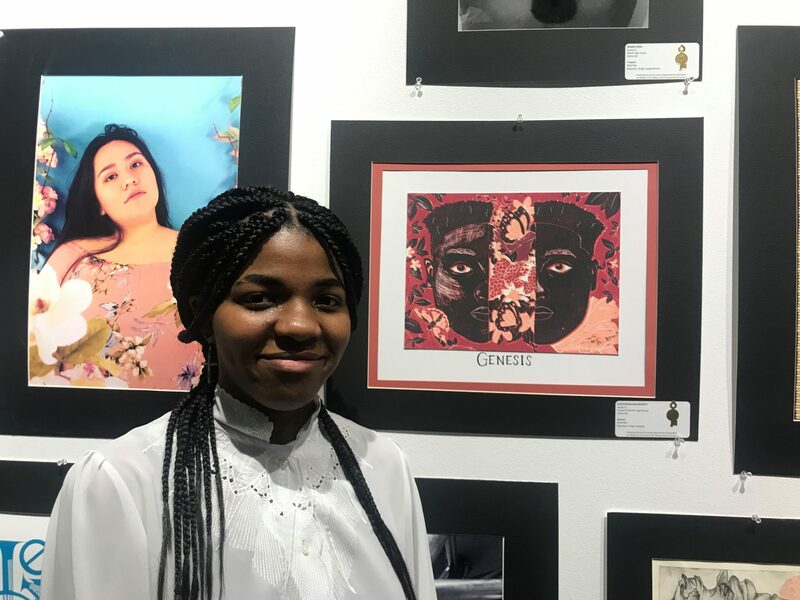 Quick to acknowledge the support she received for Genesis from her art teacher Jorge Vasquez, she said she learned and benefitted from her teacher who specializes in printmaking as an artist. “He challenged me and made suggestions that helped,” said the 17 year old. Aldine ISD Director of Visual Art Michaelann Kelley said she is proud of all the Aldine students and teachers who commit time to Scholastic and all their artistic endeavors. Braddy’s dream is to be able to create art and make a living off of doing what she loves. She challenges other teens to follow in her footsteps. “When you have the imagination and drive and ideas, there is nothing that you really can’t do,” Braddy said, pointing to her print hanging in an HCDE exhibit at Houston’s Spring Street Studios.